Can there ever be too much pink? Pinkalicious doesn�t think so. It�s her favorite color. 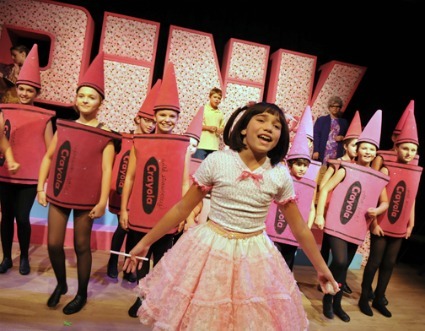 And in this musical adaptation of Elizabeth Kann and Victoria Kann�s popular children�s book (featuring music and additional lyrics by John Gregor), our pinkophile protagonist is determined to surround herself with as much pink as possible. But when this predilection drives her to get greedy over some pink cupcakes, Pinkalicious becomes �Pinkerbelle� with a severe case of Pinkititis � just the second case ever � that could find Pinkalicious forever lost in a sea of pinkishness. 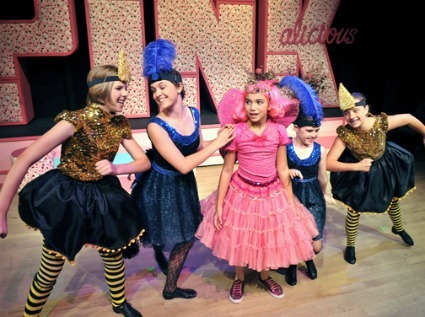 San Diego Junior Theatre staged a charming production of this little musical that is packing in audiences of pink-clad kids. Hanna Samson stars in the title role, turning in a nice performance as she sings and dances and walks upside down on her hands along her colorful journey from selfishness to exuberance to remorse and redemption. Joining her on that journey are her concerned and understanding parents (Spencer Williams and Jenna Dern), her brother Peter (Connor Cruz), Grandma (Hannah Orr), Dr. Wink (Ellie Barrett) who serves the frightening but fun diagnosis song-and-dance), and her amusing friend Alison (Brenna Fineman) who speaks to Pink in fast forward and with plenty of personality. The dynamic ensemble keeps this short-but-sweet musical humming along with a variety of musical numbers and styles, from gangsters singing the Pink Blues to flapper bees to holy rolling greens. Director Richard May�s production runs smoothly with energy and good visuals, including Mallory Devlin�s costumes, Cynthia Bloodgood�s lighting, and Tony Cucuzzella�s set which, naturally, features its fair share of pink.